I will be listing a large quantity of toys over the next few weeks. Check out my other auctions for many more 1950's - 1960's Japan boxed battery operated, wind-up, and friction toys. 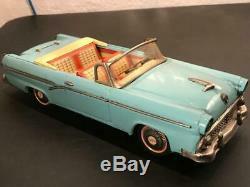 Very nice and large 12 long 1950's Japan tin friction Ford Sunliner Fairlane 500. This is a beautifully styled car with full chrome appointed accents, FORD hubcaps, fold-down front seats, and opening rear trunk. The dashboard is nicely lithographed with all gauges and it features a tin steering wheel. The car also features the FORD emblem at the front of the hood. The car is marked with the Bandai logo and Japan underneath. This toy is in excellent working condition and the friction still works smoothly. There is some light scratching as shown, the chrome has tarnished in some areas (most notably the hubcaps). The tires are still round with no flat spots. The right hinge of the trunk lid is loose. Auctiva offers Free Image Hosting and Editing. The item "12 1950's Bandai Japan Tin Friction Toy Car Ford Sunliner, Opening Trunk & Seat" is in sale since Wednesday, April 3, 2019. This item is in the category "Toys & Hobbies\Vintage & Antique Toys\Tin\Vehicles".